The new Honeywell Quiet Pro series central vacuum system power unit provides excellent performance and quality with real value from a leading central vacuum manufacturer. The new H703 model replaces the older H702 model with a more powerful two stage motor system, new low noise sound package and permanent Triumph© HEPA filter. The Honeywell central vacuums are built by Electrolux, makers of BEAM and Eureka central vacuums in North America. Honeywell Central Vacuums are produced at the BEAM industries production facility which began building central vacuum systems in 1957. EHCP (Electrolux Home Care Products) purchased the BEAM company in 1989 which also makes EUREKA and Electrolux brand central vacuums in addition to the Aggresor and BEAM brand vacuum systems. EHCP now offers central vacuums in over 50 countries around the world. The Honeywell brand power units can be matched with other brands of central systems and works great as a replacement power unit for older models and other brands. The Honeywell H703 model CVS power unit is an attractive design that is strikingly similar to the BEAM 275 & 375 models in both size and performance. Built from a cold form 22GA steel housing with powder coat matte white finish for durability and long lasting good looks. The new Honeywell models are reliable and durable, and backed with a 5-year electrical & lifetime body limited warranty. 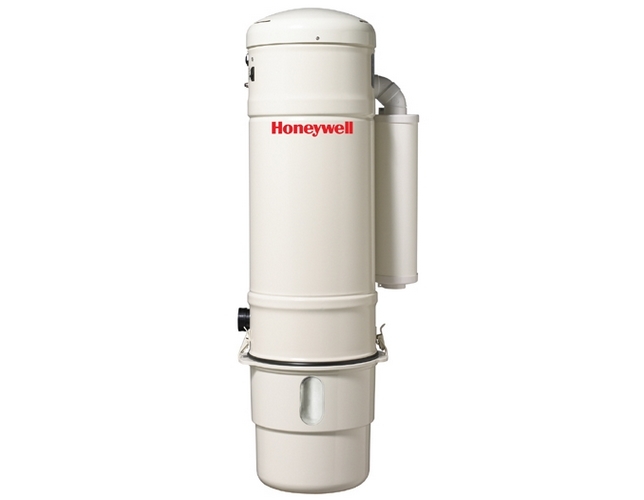 Honeywell H703 & H803 models feature a patented sound-reducing technology for lower power unit noise levels and both models include an exhaust muffler along with a unique anti-vibration hanger bracket that reduces power unit noise even further. A sophisticated control system designed and built by Electrolux features slow motor start which protects the high power dual stage motor by slowly ramping up the motor voltage when turned on. The control system also includes easy connect speaker style low-volt wire connectors and a detachable 6 foot 3-wire power cord. The H703 is rated for cleaning areas up to 8,000 square feet with a 600 airwatt maximum suction motor (unit rated 590 airwatts) for exceptional cleaning power. The dual stage Ametek-Lamb brand AirWatts series motor provides the system with a maximum 140" lift (138" in unit) and 125 cubic feet per minute (124 in unit) of airflow for outstanding cleaning performance on both hard floors and all carpeted areas. With the patented Quiet Pac© sound insulation system, the Honeywell H703 is engineered for installation in all areas, even where noise may be a factor. The H703 power unit provides excellent cleaning with 100% filtration when vented outside by use of a permanent filter system that is self-shedding and maintenance free. Debris collection is easy to manage with a lightweight 4 gallon bin that has a view through window to monitor dirt level and sturdy steel latches. The H703 can easily be converted to a disposable paper bag system (adapter required, not included) for clean and easy disposal and offers bi-directional intake for left or right mounting options. The Honeywell H703 power unit is a mid-size footprint, and easy to mount in most any location. The most popular model type of the Electrolux metal body power units the H703 central vacuum power unit provides exceptional performance and unmatched cleaning value.